Criminal prodigy Kaz Brekker has been offered wealth beyond his wildest dreams. But to claim it, he'll have to pull off a seemingly impossible heist:Break into the notorious Ice Court (a military stronghold that has never been breached)Retrieve a hostage (who could unleash magical havoc on the world).Survive long enough to collect his reward (and spend it).Kaz needs a crew desperate enough to take on this suicide mission and dangerous enough to get the job done - and he knows exactly who: six of the deadliest outcasts the city has to offer. Together, they just might be unstoppable - if they don't kill each other first. I am re-reading this book for the second time and I couldn’t be any happier. I started her other trilogy but found myself at a stopping point but I have no idea where she was going with Six of Crows but I lost myself in its page once more. Six of Crows is in the world of Grisha but it follows a different set of six characters each with their own story. Embarking on a mission that almost seems impossible Kaz Brekkar, if successful will go down as one the best thief in history. Will they find themselves successful? Well that is where you, the reader, come in to see this journey pan out. To be honest, I did read this book pretty fast but not as fast as I had thought I would. And before you think anything, reading it at the pace I did was by far the best pace to read this book. I felt I was a seventh crow in this journey and I was absorbing everything that the book could offer. I was attached to the characters in a way that I don’t think I probably ever felt while reading Shadow and Bone and that proved to be exciting. In this novel, the cast of characters are so diverse bringing something different. I think this was Leigh Bardugo’s biggest success in this novel. Having the writing flow seamlessly through the multiple POVs was just incredible to see and follow. 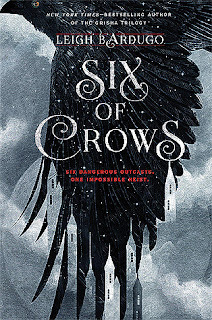 I thought that we were able to really connect with Out of the six crows, Jesper has to be by far my favorite. Something about him just clicked with me and seeing his interaction with the others, especially Wylan, allowed me to really latch onto him as he grew in the story. Overall I am excited for the next book. Leigh Bardugo captured me in a way I was never expecting. In a story full of emotion, adventure, magic, loss, and looking for belonging Bardugo crafts together a brilliant story that is suited for all ages.